Princeton University Press, 9780691156361, 265pp. In this prequel to the now-classic Makers of Modern Strategy, Victor Davis Hanson, a leading scholar of ancient military history, gathers prominent thinkers to explore key facets of warfare, strategy, and foreign policy in the Greco-Roman world. From the Persian Wars to the final defense of the Roman Empire, Makers of Ancient Strategy demonstrates that the military thinking and policies of the ancient Greeks and Romans remain surprisingly relevant for understanding conflict in the modern world. The book reveals that much of the organized violence witnessed today--such as counterterrorism, urban fighting, insurgencies, preemptive war, and ethnic cleansing--has ample precedent in the classical era. The book examines the preemption and unilateralism used to instill democracy during Epaminondas's great invasion of the Peloponnesus in 369 BC, as well as the counterinsurgency and terrorism that characterized Rome's battles with insurgents such as Spartacus, Mithridates, and the Cilician pirates. The collection looks at the urban warfare that became increasingly common as more battles were fought within city walls, and follows the careful tactical strategies of statesmen as diverse as Pericles, Demosthenes, Alexander, Pyrrhus, Caesar, and Augustus. 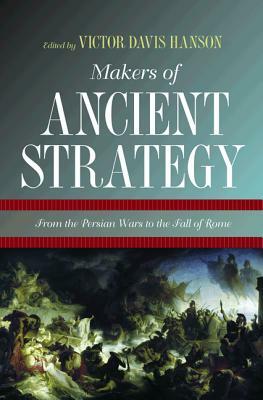 Makers of Ancient Strategy shows how Greco-Roman history sheds light on wars of every age. In addition to the editor, the contributors are David L. Berkey, Adrian Goldsworthy, Peter J. Heather, Tom Holland, Donald Kagan, John W. I. Lee, Susan Mattern, Barry Strauss, and Ian Worthington. Victor Davis Hanson is the Martin and Illie Anderson Senior Fellow in Classics and Military History at the Hoover Institution, Stanford University. He is a recipient of the National Humanities Medal. His many books include A War Like No Other and Between War and Peace. He is a syndicated columnist for Tribune Media Services, and is the current codirector of the group on military history and contemporary conflict at the Hoover Institution.